The trailer for Bitter Feast. “He’s a food blogger,” Peter Grey spits the words out with disdain. A few hours ago, Grey was a chef with a television show, a restaurant, and an endorsement deal for a line of cookware. Now, one overly snarky online review later, he’s got nothing. The show is on the verge of being cancelled, his kitchen is in the hands of another chef, and the cookware… Forget it. Convinced his woes are entirely the fault of the bad review—and not because he is an uncharismatic, pompous creep—Grey kidnaps the blogger and exacts brutal culinary comeuppance. Revenge, it seems, is a dish best served to order—raw and bloody. 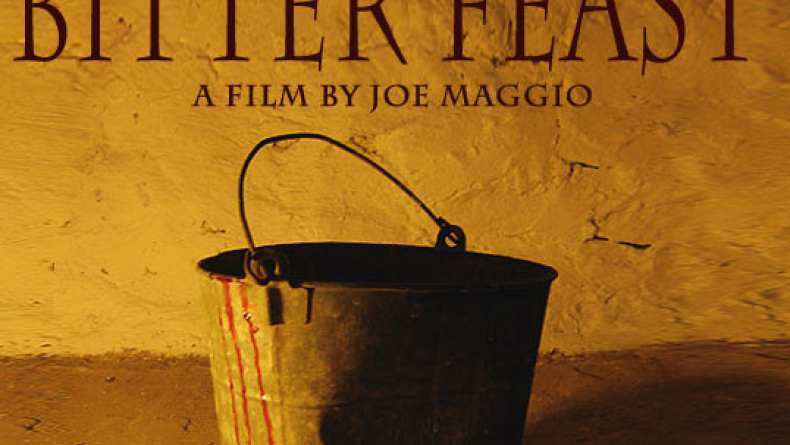 The latest offering from producer Larry Fessenden’s stable of low budget shockers, Joe Maggio’s darkly comic thriller casts a caustic eye on bloggers and foodies alike, as it takes the sometimes contentious relationship between critics and the critiqued to some outrageously extreme lengths. Starting with a first act entrée of wicked humor, but growing darker with each new course, Bitter Feast is guaranteed not to go down easy.